Communicating effectively with your athletes is as much a part of coaching as creating a schedule or giving advice. These days, most coaches are communicating via email, which has it’s own set of pros and cons. Effective emailing is a skill that all coaches need to be able to use in order to attract and retain clients. Just like training for your sport, email writing is a skill that you can improve. You don’t have to be that coach who whips out a quick email and just hope it works. Effective emailing is especially important for those athletes living in a different state or country. I’ve been testing response rates and getting feedback from my athletes for years and I want to share with you the techniques I use to ensure successful coaching relationships. These techniques are based on psychological principles. Imagine the inbox of your client. They get dozens if not hundreds of emails every day, plus the ones they didn’t get to from the day before. Write a compelling subject line that will grab the attention of your athlete. This should describe the subject of your email. Do not simply write hello or something similarly short and non-descriptive. A good subject line is clear, simple and descriptive. The following are good examples of effective subject lines: Your key workouts for this week or A follow up about whether to buy a CX bike or TT bike. Your email needs to not waste your athletes time and provide coaching value to them. One challenge comes when you are trying to write professional emails to your athletes, especially since over time many of us become friends with our athletes and revert to a more casual email tone. In either case, you want your emails to end with a clear call-to-action (CTA). This is the key component of the message. An example would be something like, “Email me back with the day you want to ride together this week”. If you have an unclear CTA, you may end up with several back and forth explanation emails (especially about new workouts), which is a waste of time. If you accidentally write an unclear email, after two rounds of emailing I suggest to just pick up the phone and call to sort out the details. Some of the most common reasons you may be emailing your clients include: Feedback on a workout they completed, adjusting the schedule, providing motivation or clarification and if they are doing something you want to change, i.e. riding in Z3 when you want them in Z4. Get inside the mind of your client. What type of communicator are they? The more you can learn about the rest of their life, their family, the way they approach their job, the more you can target your emails to things they care about. For a busy parent for example, you might want to mention how a workout will be challenging but short and will allow them to get to the kid’s soccer game on time. When explaining why they should do something, use stories of others doing it to illustrate social proof. I found that relating how others (often ‘the pros’) have used certain workouts for success in the past or have used certain race strategies to win can make a workout prescription more tangible. Coaches should also consider setting up a UNODIR “UNless Otherwise DIRected”. This is a military term that I consider when I want to give a general rule of thumb. Sometimes you may want to teach your decision making process to your athletes. This prevents a lot of last minute updates and back and forth questions. For example you can answer one time for all future occasions. For example, athletes often wonder what to do if they miss a workout. Rather than answering every time, you can give them a single, less descriptive answer that they can apply in that particular situation. Timely communication is essential to building a trusting relationship, and easier than ever when you can respond on your phone. You should be answering emails within 24 hours or quicker. Positive feedback after a workout can keep your athlete on the right track (behavioral conditioning works on people too). Using Trainingpeaks’ Post Work Notification feature for Premium Athletes can help you stay on top of your athlete’s key workouts and help you provide rapid feedback. 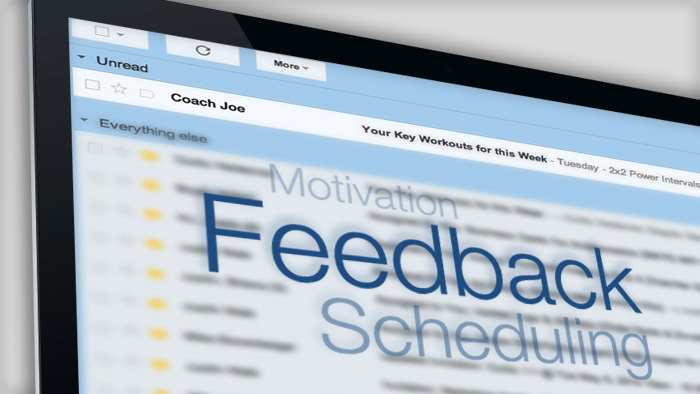 Often coaches have a set weekly review email they send to their athletes. What day you send that email matters. I like to use Monday afternoons or Tuesday mornings, when people are likely to be finished getting through their first important work emails. As a coach, it’s part of your job not to take a non-response personally. If you want a response from your athlete and they don’t respond right away, it’s probably because they are busy. Most busy people consider it polite when you follow up on an email. Using these guidelines and tips you can use email as a powerful tool in your coaching arsenal. Clear communication leads to happy clients, which leads to better results, which leads to clients giving you great word of mouth referrals and staying on longer. So don’t underestimate the power of an email.